I have often expressed that I want to hear your experiences and journeys with God. So, I was delighted when I was asked to consider posting the following thoughts of one of my readers. Like many of us, her relationship with God has been a complicated one, and I'm not sure any of us ever get it right until the moment we are face-to-face with Jesus. But I love to hear the things God is teaching you -- your new perspectives on old precepts. By sharing our journeys, we may impart a new jewel of knowledge, or reinforce a word from God that we have let slip away. So, take a moment, and read this reader's story, and see if you can identify. I recently received a revelation while reading 1st Chronicles, Chapter 28. It is where King David is passing his Kingdom on to his son, Solomon. The passage starts out telling us that King David had gathered, in Jerusalem, "all the officials of Israel, the officials of the tribes, the officers of the divisions that served the king, the commanders of thousands, the commanders of hundreds, the stewards of all the property and livestock of the king and his sons, together with the palace officials, the mighty men and all the seasoned warriors". Obviously, this is going to be a very big event! Everyone who was somebody had gathered, along with all the people. 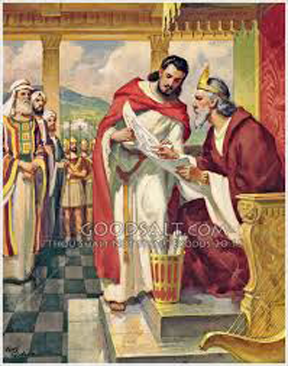 and I am sure King David had prayed about the speech he would give for a long time. He had to know it would be important to Solomon, as the soon-to-be King, as well as all the people who were present. The first thing King David says in his speech to Solomon is "know God". Until recently, I had never realized how important those two words were. That is what King David deemed most important for Solomon to do, and the same advice applies to us, as it does to Solomon. Notice the words weren't "know about God". I know many of us have been brought up knowing the Bible stories and having an idea of what God is about, but at what point do we begin to actually KNOW God? King David goes on to say "If you seek Him, He will be found by you". This implies that it will take work on our part to actually get to know God. I guess like anything else some may find Him quite easily, but for me it was somewhat of a process. I had to learn to talk to Him in ways that I find uncomfortable when talking to people. It took some persistence and lots of knocking [for that door to be opened] and to find a real relationship with my Father. Now, after lots of work, there are days when He and I are completely in sync. We have a constant banter, if you will, running throughout the day. He gives me instructions and I follow them even when I think He's crazy. I am starting to learn that if I follow His instructions I will be okay. Sometimes I hesitate to step out to do what He is guiding me to do, and His voice in my head gets a little louder and more stern, so then I listen and do whatever I'm supposed to do. He has not failed me yet! I also still have days where I feel so very far from His presence. I know that has nothing to do with Him and everything to do with me. I can see Him saddened when I put distance in our relationship, and I know it is something I need to work on. Any relationship takes work, but this one is the most worthy of your time. It took me longer than it should have to get to know God, but the important thing is that He was waiting there for me the moment I surrendered to Him. Take the advice of King David ... when you know God, you can't help but serve Him with a whole heart and a willing mind. And that results in a relationship beyond all earthly treasure! Did you see yourself in this testimony? I will agree that actually KNOWING God is one of the most difficult tasks in a Christian's life. But it starts with doing what she did ... keep on asking, keep on seeking, and keep on knocking ... and God will respond to your persistence. Secondly, did you notice the over-riding theme of her story? Did you see that it took persistence AND obedience until that door was finally opened and she experienced the intimacy with the Father that all of us [and He] desire? But also notice that there are days when He feels far away from her. I know that happens to all of us, too. It certainly is part of my journey. But she rightly lays the blame at her own feet, and knows she still has work to do to tear down those walls of aloofness that keep distance between her and the One who loves her like no other. Her final admonition is right on target -- it takes work! And we do well to remember King David's final words to his son in Chapter 28 ... "Be strong and courageous and do it. Do not be afraid and do not be dismayed, for the Lord God, even my God, is with you. He will not leave you or forsake you, until all the work for the service of the house of the Lord is finished". YOU are the unfinished work! YOU have been designed to serve the house of the Lord, and He will not quit on you until the day Jesus Christ returns! So, rejoice in this relationship and work at it like your life depends on it ... because it does! Philippians 1:6 "I am convinced and confident of this very thing, that He who has begun a good work in you will [continue to] perfect and complete it until the day of Christ Jesus [the time of His return]".